0.118" (3mm) dia x 0.039" (1mm) thick, Set of 10. N55 Rare Earth Neodymium Disc Magnet, Magnetized through the thickness. Titanium Nitride Coated. Disclaimer: These catalog parts are not intended for medical use or internal use in the body as they may not have been subjected to the testing requirements necessary. Please consult a medical professional before considering that application. 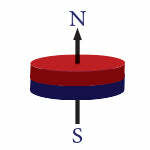 Neodymium Disc magnet are the strongest permanent magnet available. Neodymium disc magnets come in many grades and are used in applications where a stronger magnetic field is required in a smaller area. Our Small Disc Magnets are defined as a tiny neodymium magnet with a diameter between 0.0397" (1.01mm) – 0.250" (6.35mm). The size of the diameter of a disc magnet has a direct impact on the holding force, pull force, and magnetic field profile. Small disc magnets are predominately used as sensor magnets, medical device magnets, craft magnets, consumer electronics magnets, and holding applications. Need a custom size? These small neodymium disc magnets can be manufactured with the Direction of Magnetization through the thickness or diameter.